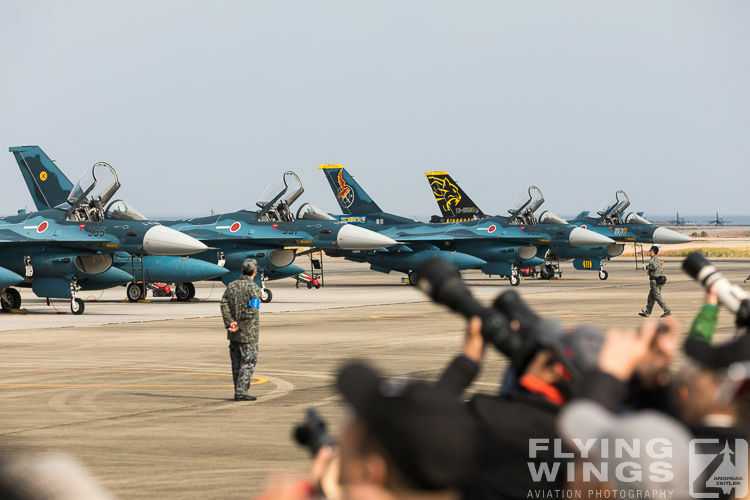 The Tsuiki airshow 2018 was a blast! 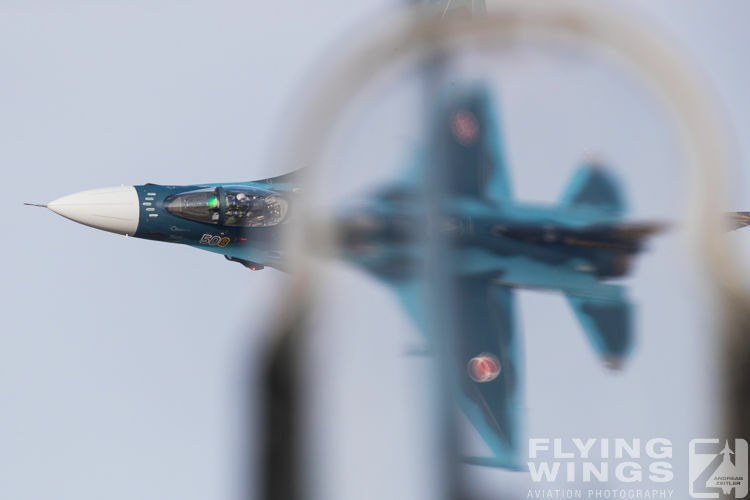 After some visits to this show two important things for a successful event came together that year: great flying and nice weather. 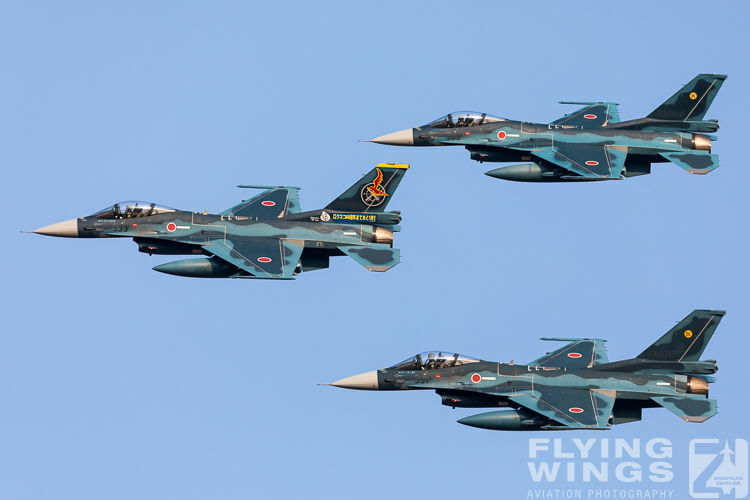 As the weather can get nasty at the end of November on the Southern Japanese island of Kyushu, it was splendid to see the sun coming out at the beginning of the flying display at 8am. 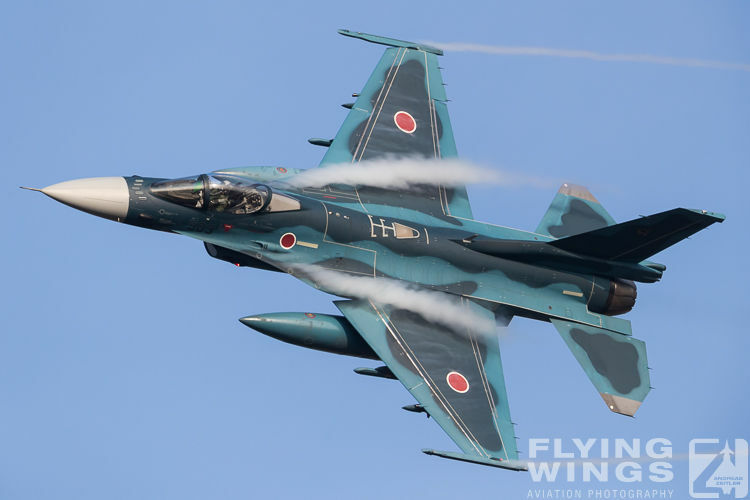 As always for airshows in Japan it was an early start! 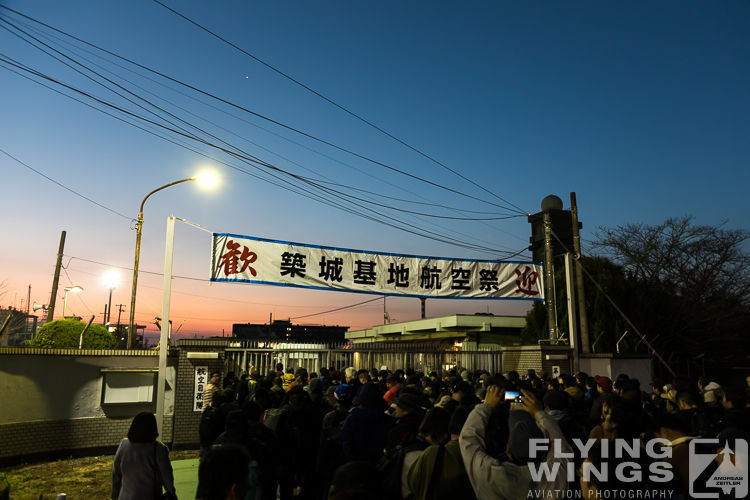 Already before sunrise eager enthusiasts were queueing in front of the main gate at the Tsuiki Airbase. 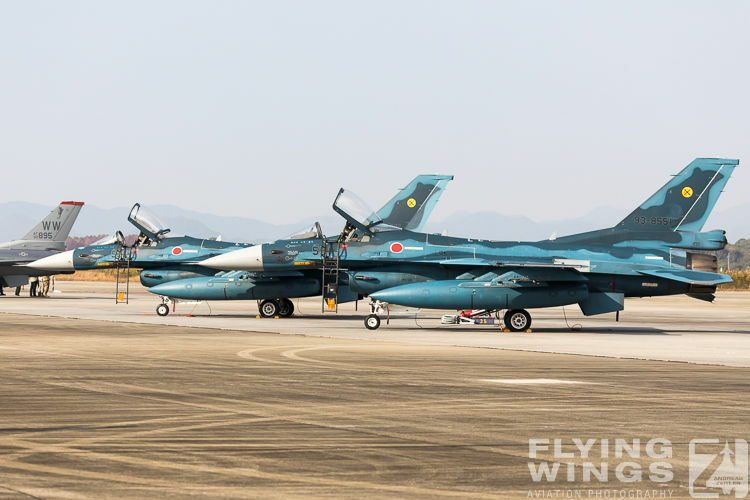 Their aim was to be the first on the apron later on in order to get the best possible view on the flightline. 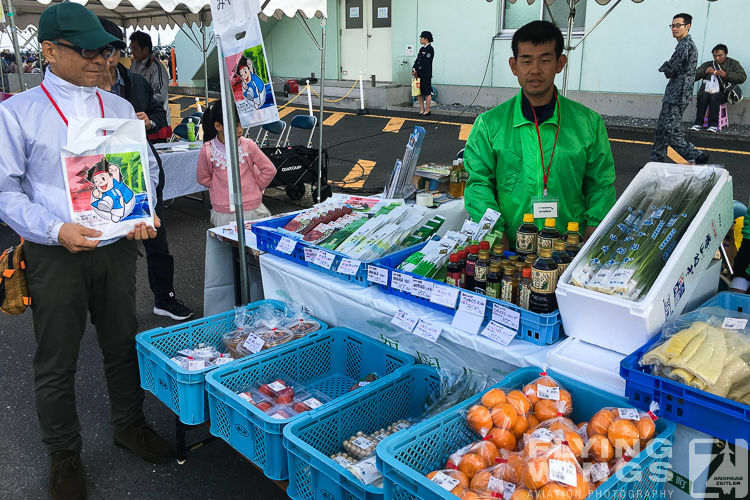 However, even though the main gate opened very early at 6.30am, it was only possible to access the ‚market place’ at that time. 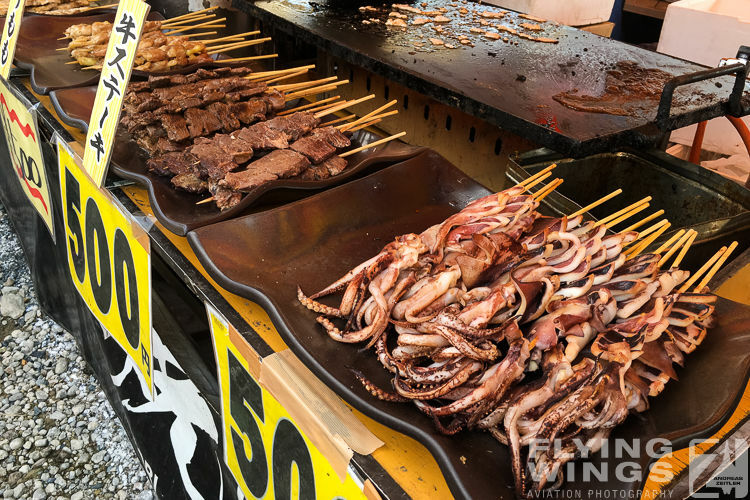 That‘s a good chance to get something to eat - how about an early morning Japanese burger or fish dishes? 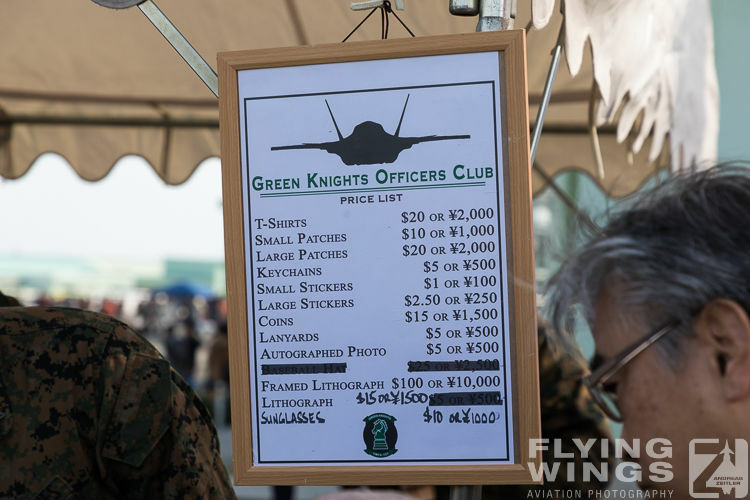 - or to do some shopping. 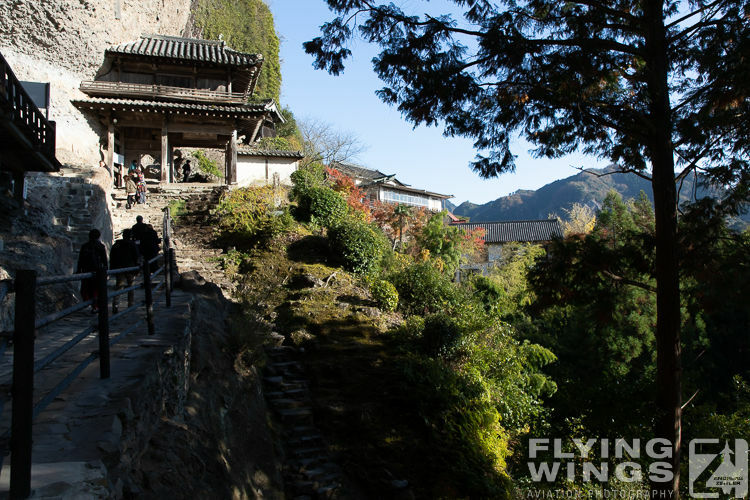 During the lunch break this area gets more than busy, so a relaxing shopping tour is better done early in the day. 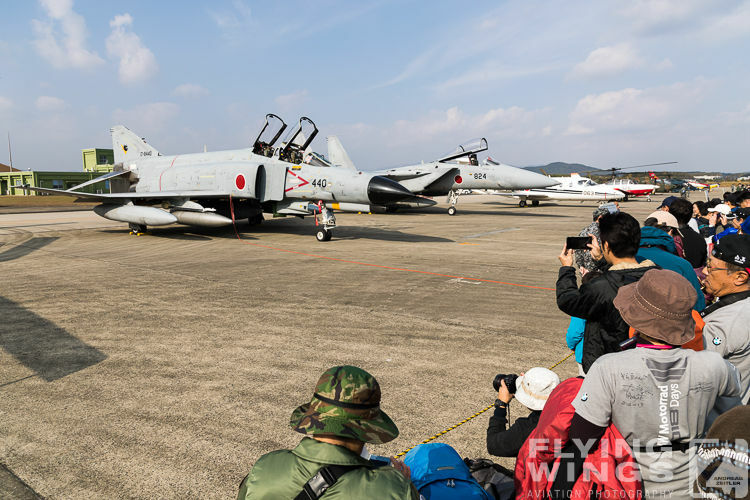 Then came the next stop during the Tsuiki airshow rush: queuing to finally get on the main ramp! 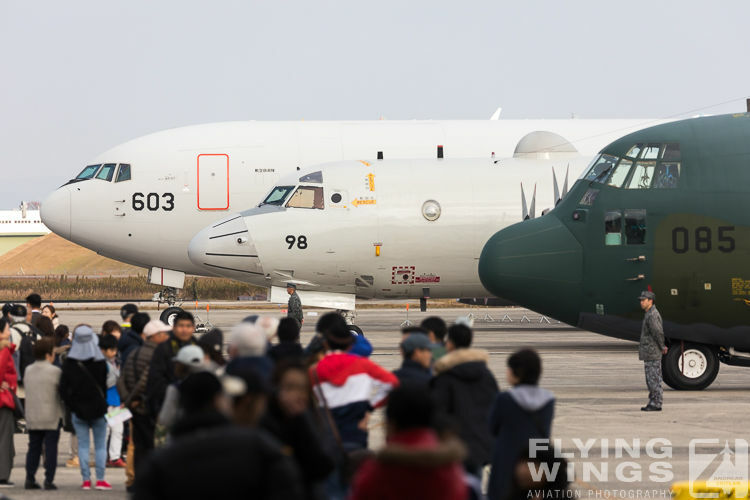 The first act on the flying program was listed at 8am, and this means engine start up approximately 20 min earlier and start of aircraft taxiing about 10 minutes before take-off. 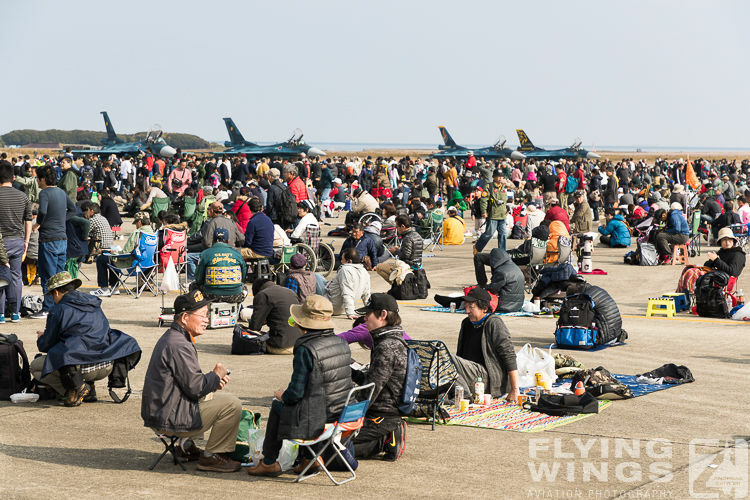 Luckily the apron opened this year rather early around 7.30am. 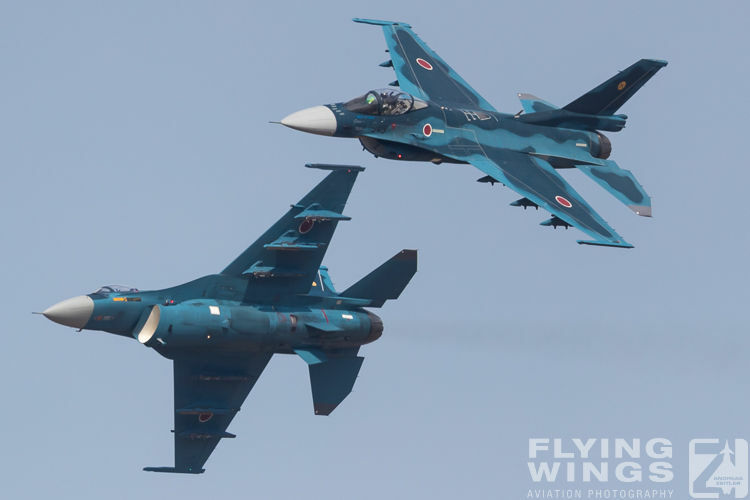 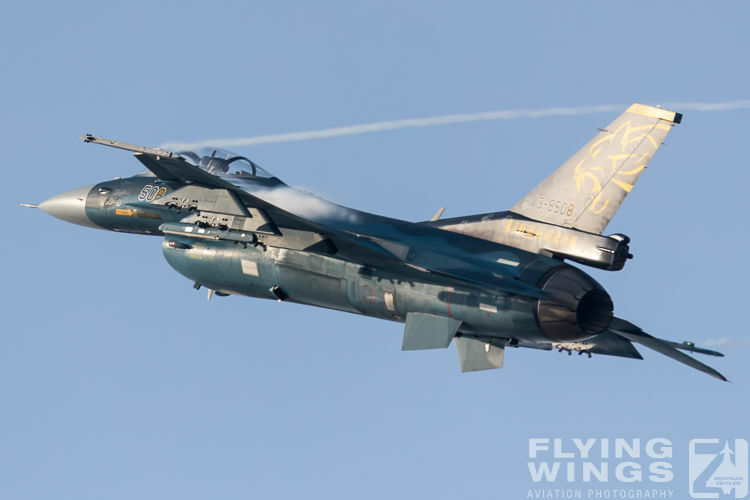 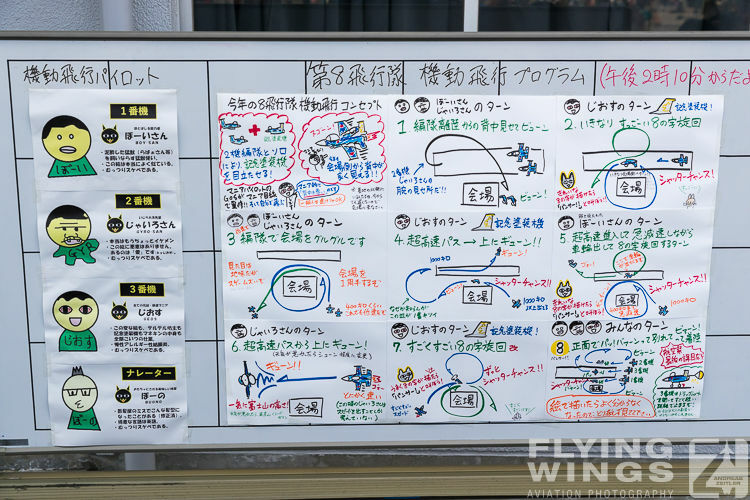 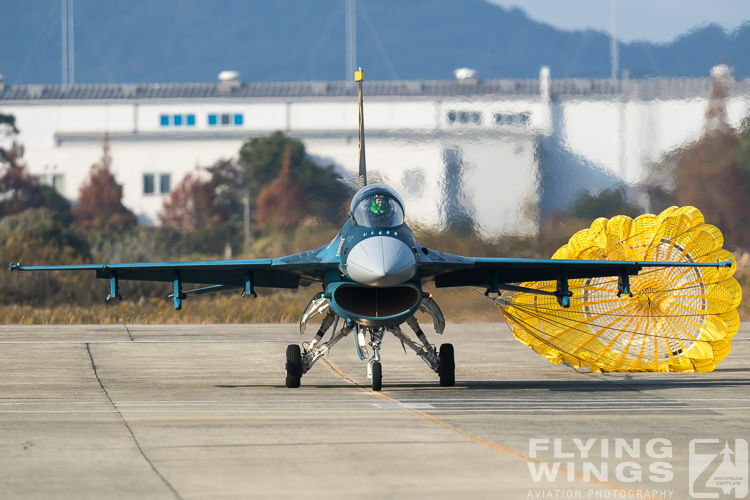 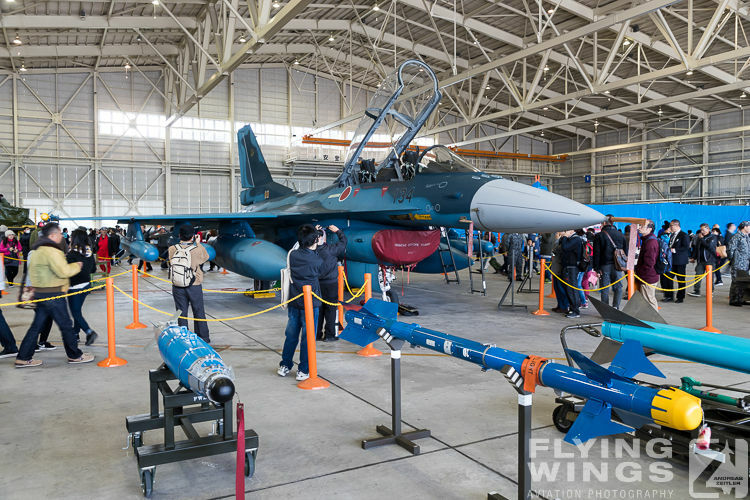 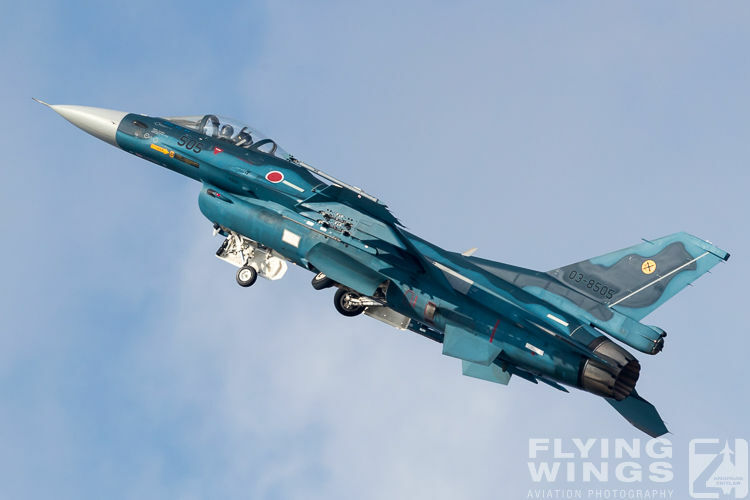 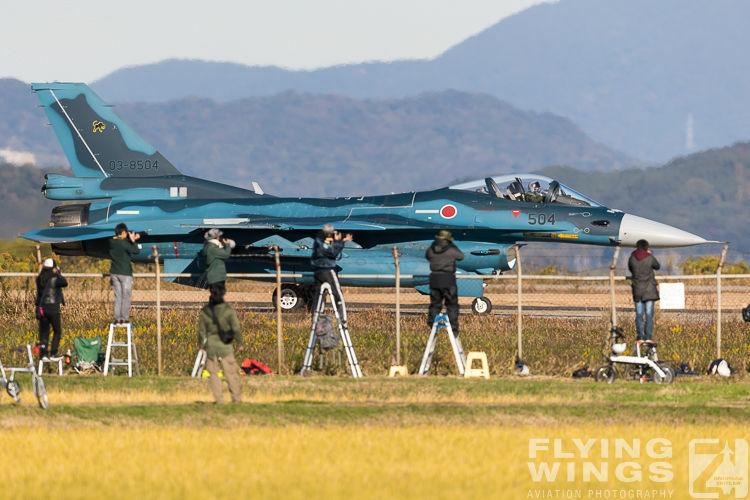 Therefore it was possible to catch the two F-2A special schemes of 6 and 8 Hikotai already on the ground before they went out for the first flying activity of the day. 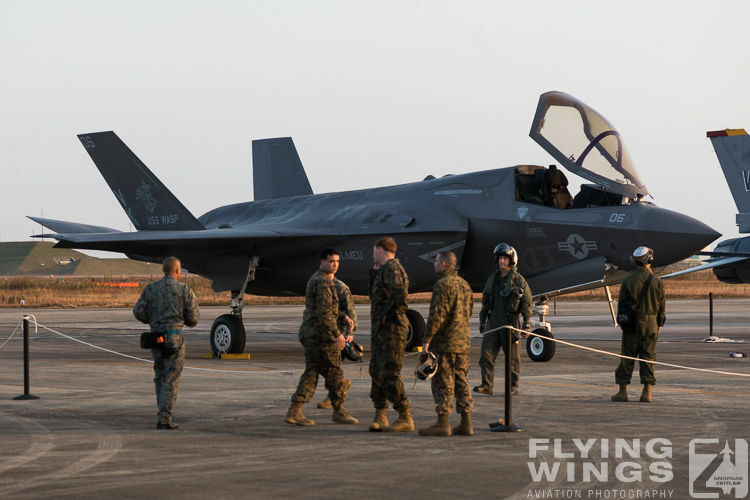 When the ropes to the apron are lifted, the early morning rush is something that has to be experienced Or seen to be believed! 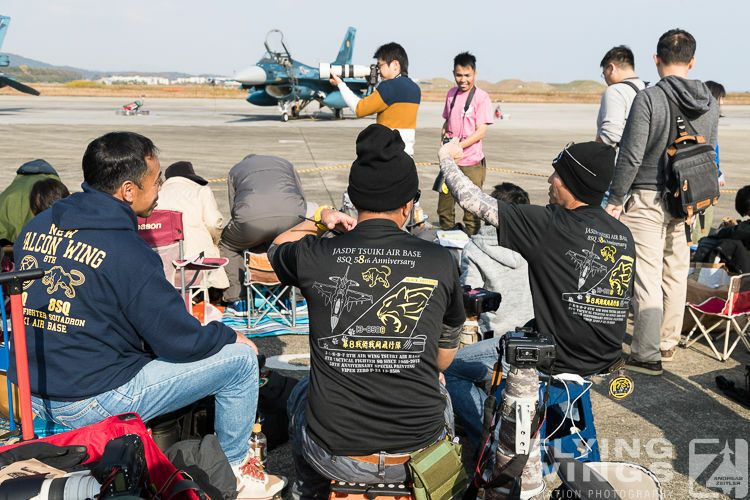 People start running, some are strolling, others actually fall down when trying to run as fast as possible to secure their spot in the first row, directly in front of the lined up jets. 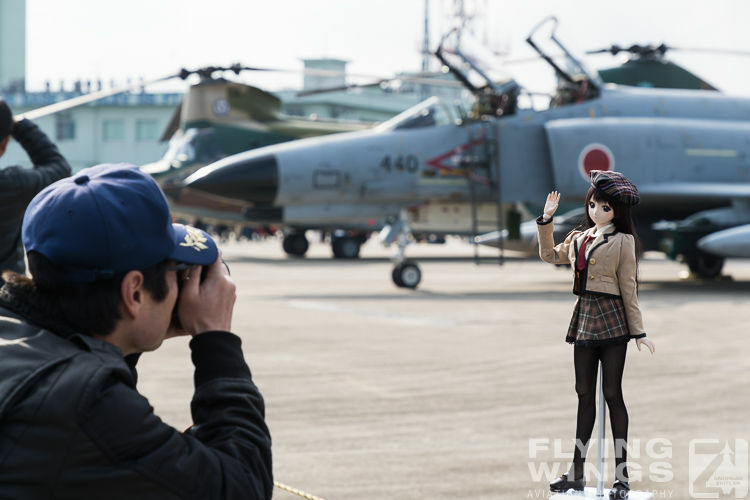 But mostly after some meters the heavy burden of the photo equipment on their back slows down most of them. 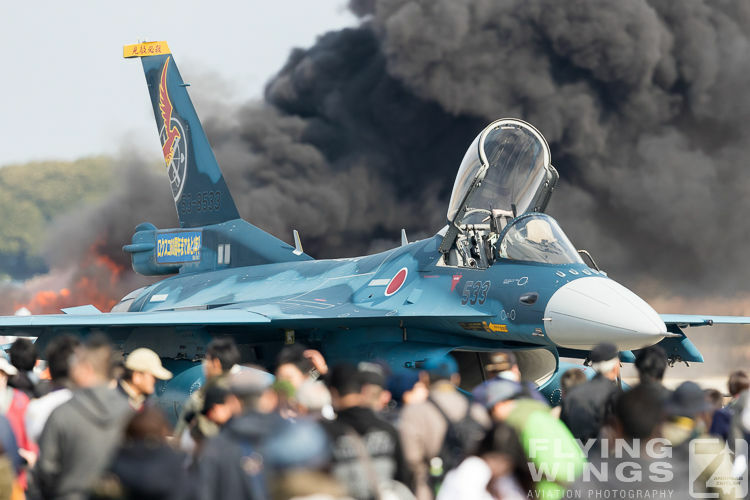 Therefore the first row does actually not fill up as fast as one would expect. 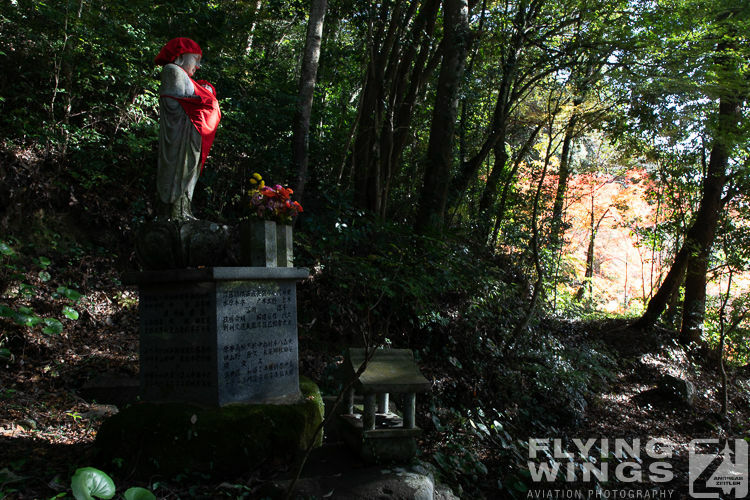 Then it was about time to sit down, and relax. 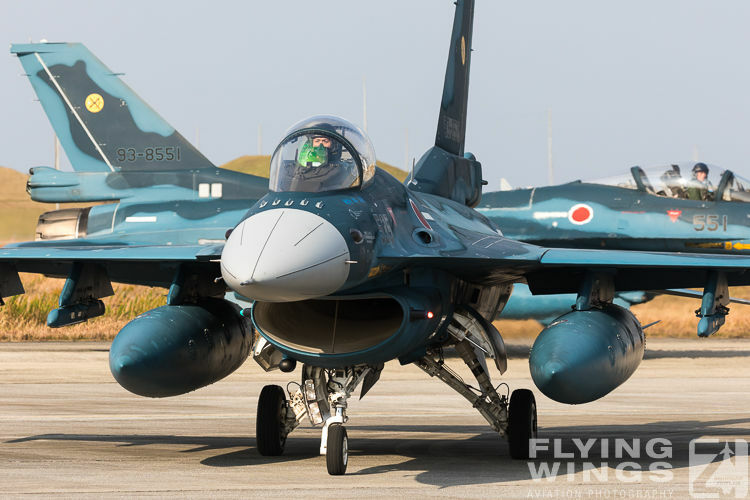 A cool airshow day was about to start! 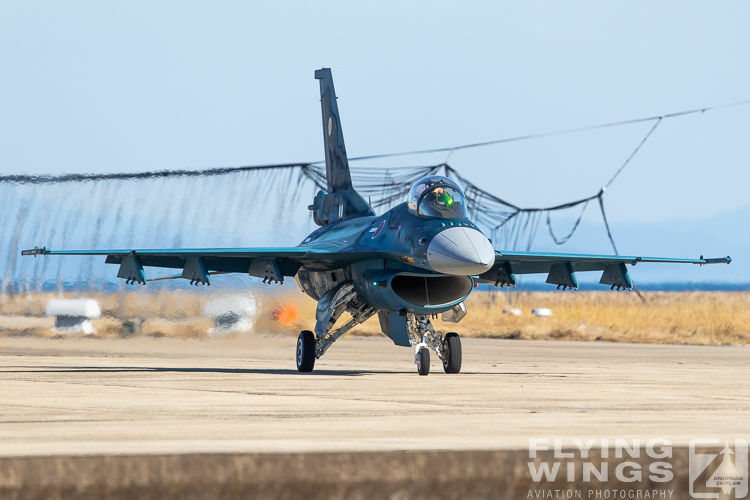 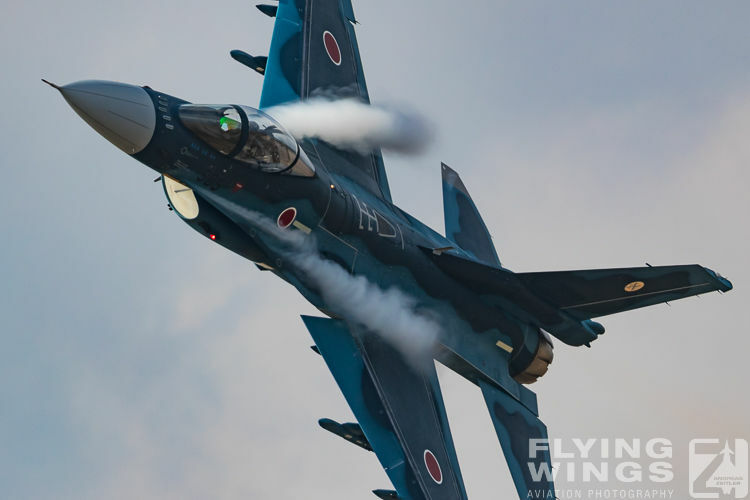 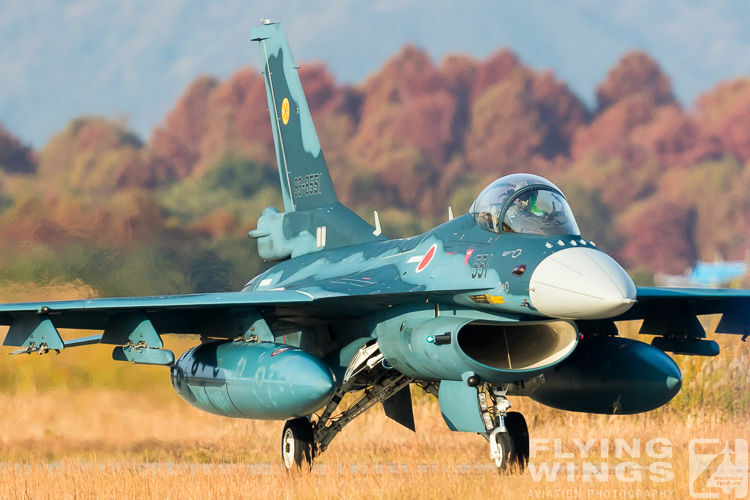 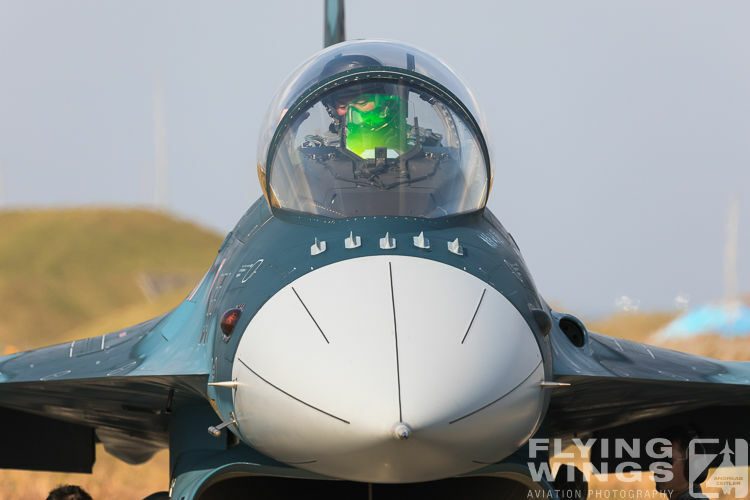 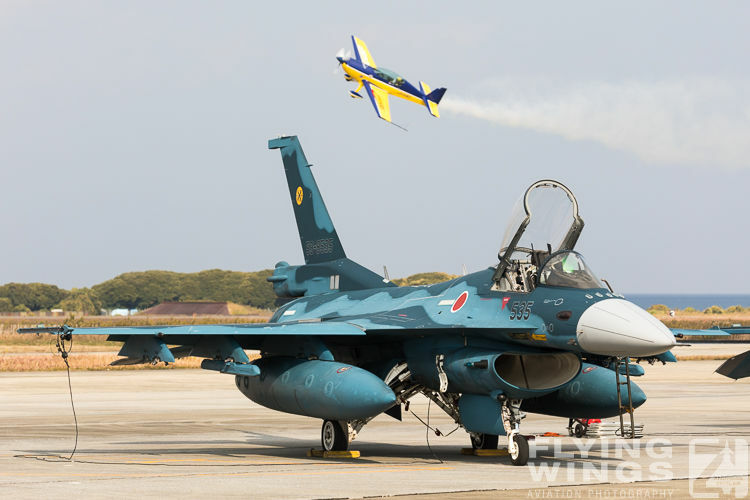 The flying display at Tsuiki was dominated by the Mitsubishi F-2 „Viper Zero“. 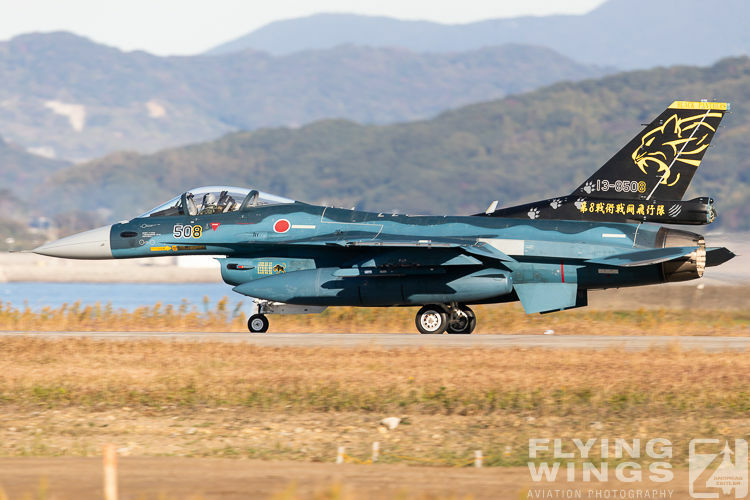 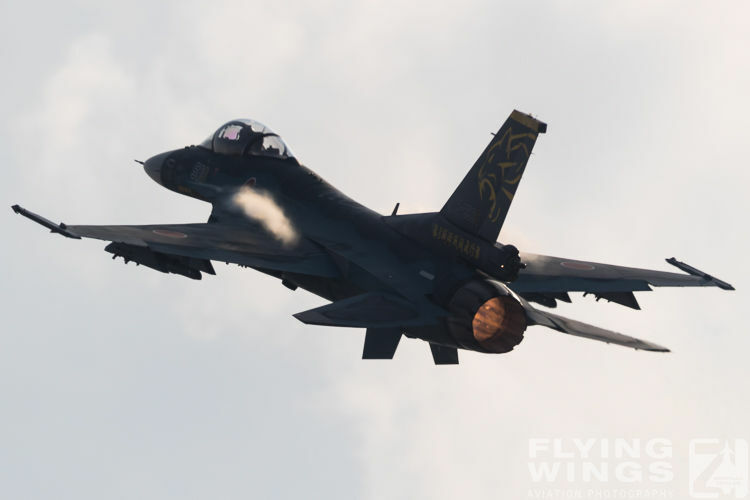 With the 6 Hikotai (Squadron) and 8 Hikotai „Black Panthers“ the aerial displays focused on the capabilities of this indigenous (and F-16 lookalike) fighter jet. 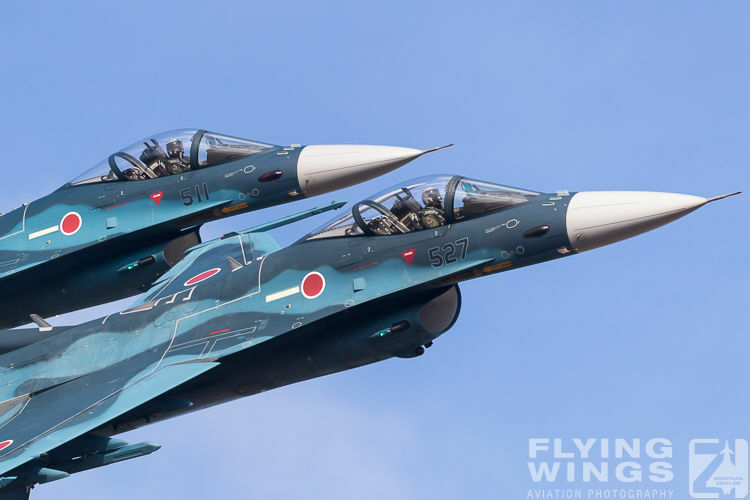 First was a formation of three jets of each of these two Squadrons, that first presented a nice fly-by as a six-ship formation. 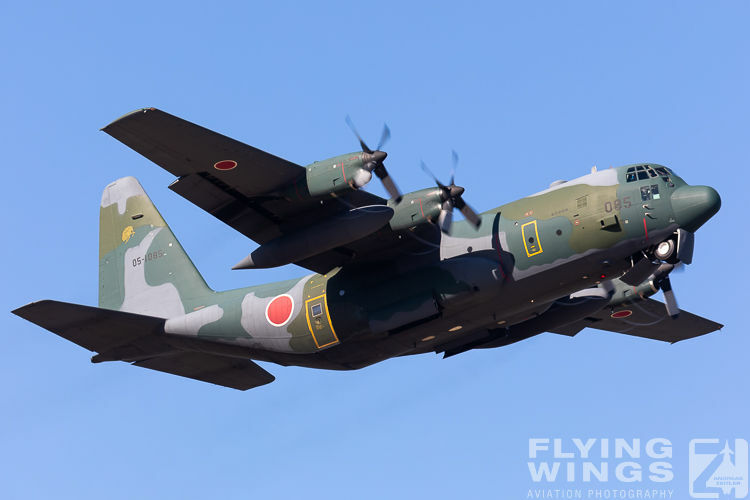 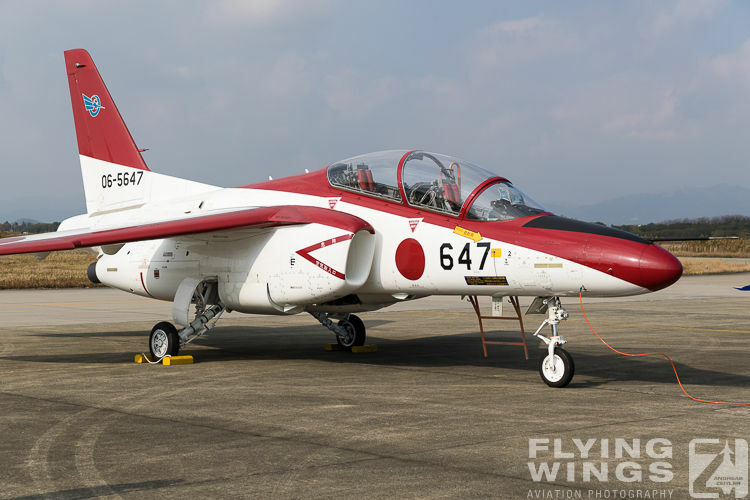 It was led by two special marked jets, of which especially serial number ‚508‘ of 8 Hikotai with its black tail stood out. 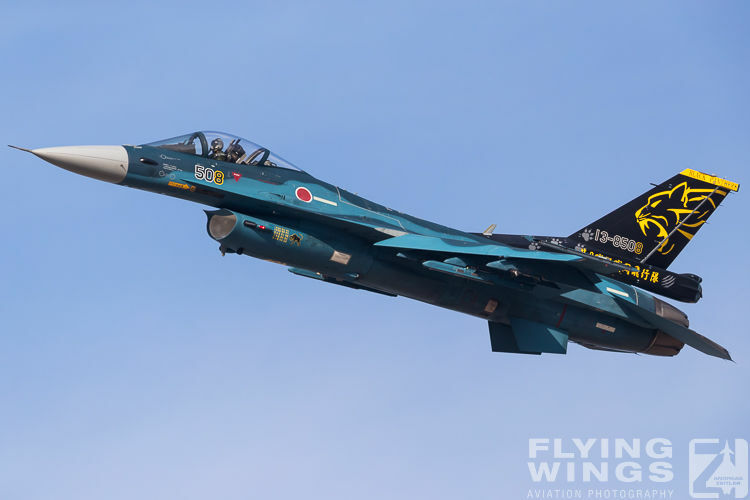 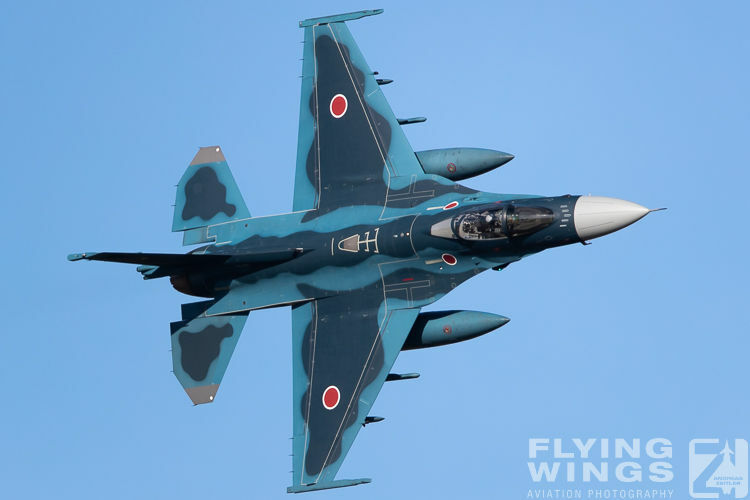 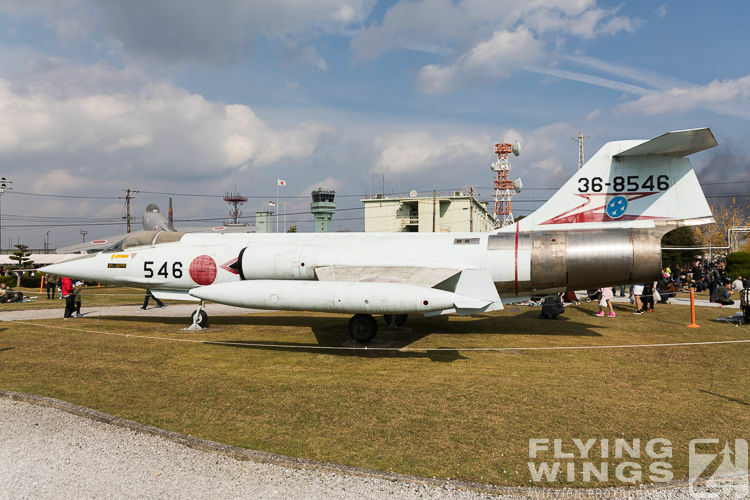 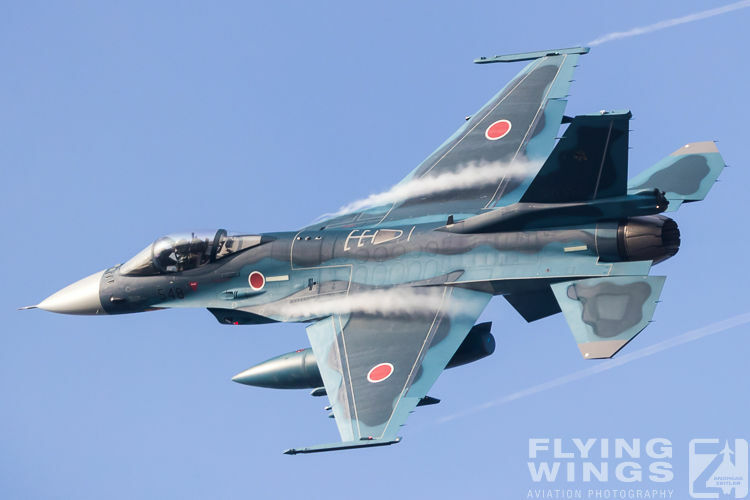 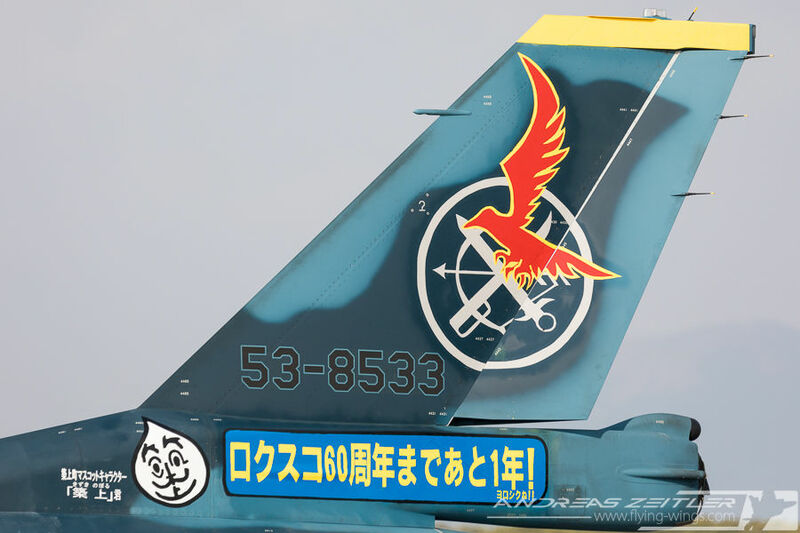 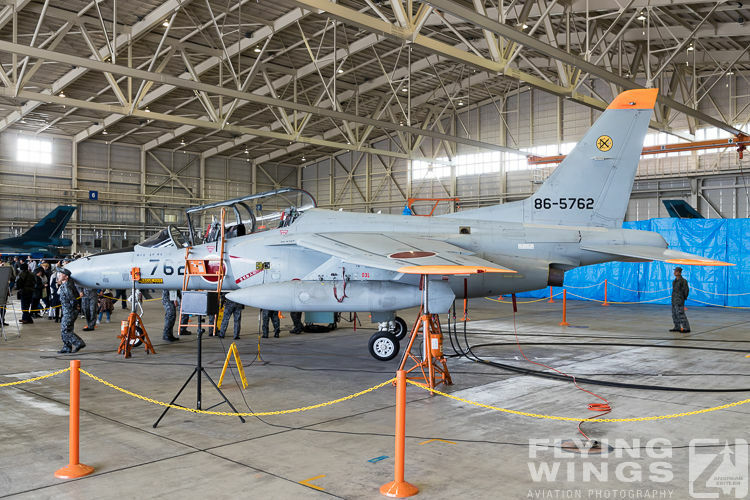 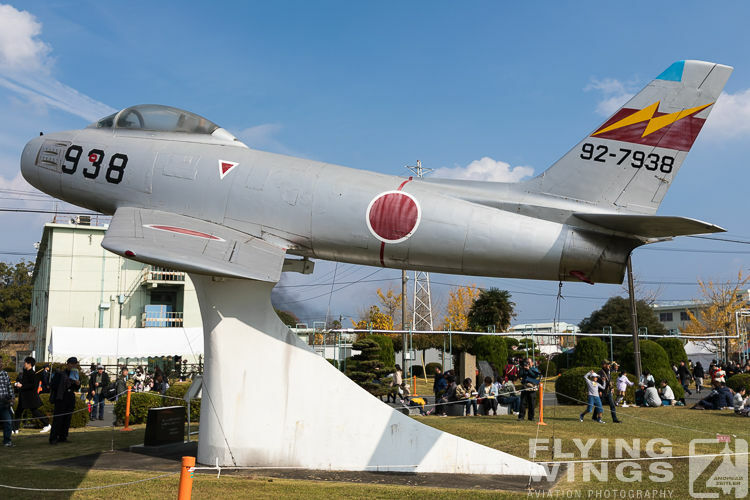 With no special occasion for this scheme, the Hikotai jet wore the announcement of the Squadron’s 60th anniversary in 2019 on the tail. 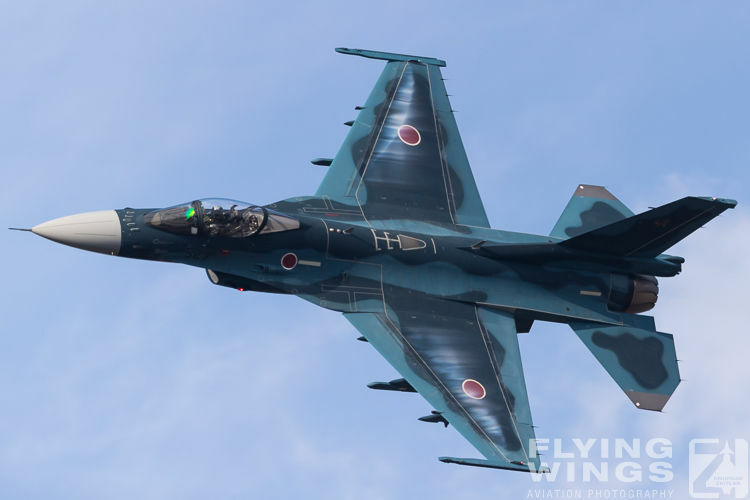 So a bigger and a more colorful paintjob can for sure be expected for the airshow in 2019. 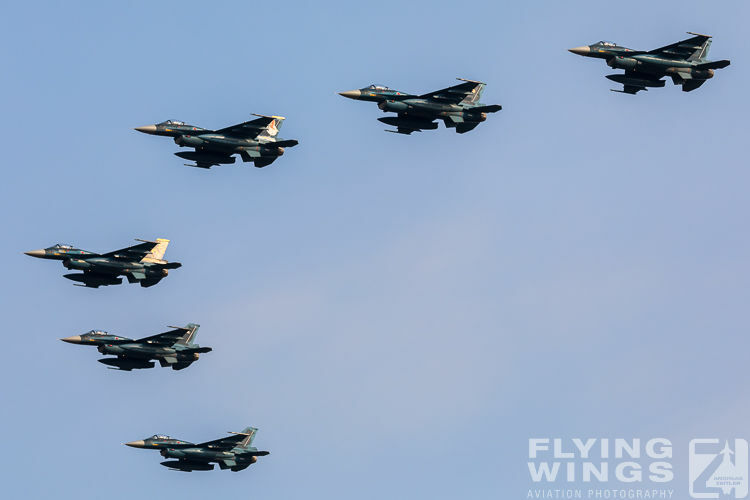 Especially of interest in this year was the presence of the US Air Force F-16 Fighting Falcon display team. 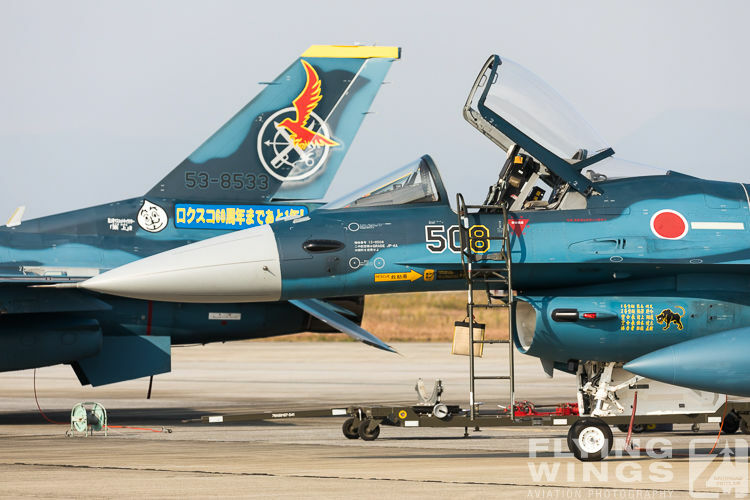 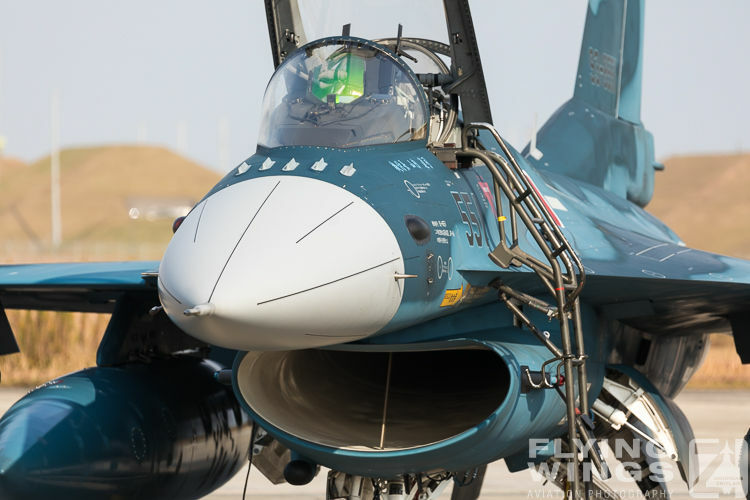 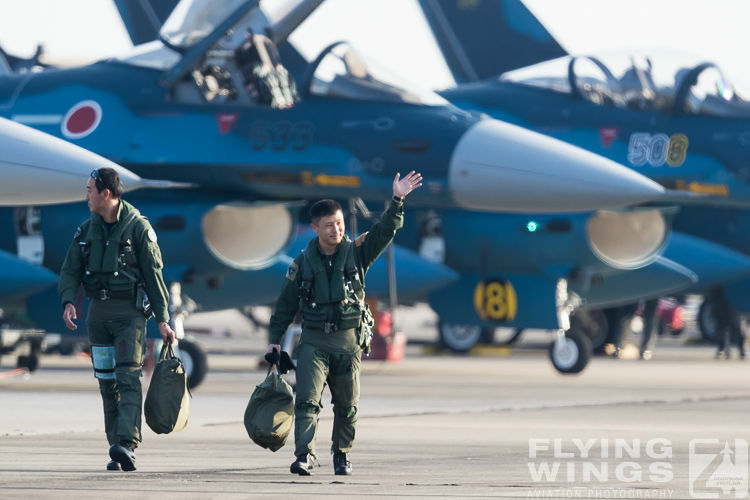 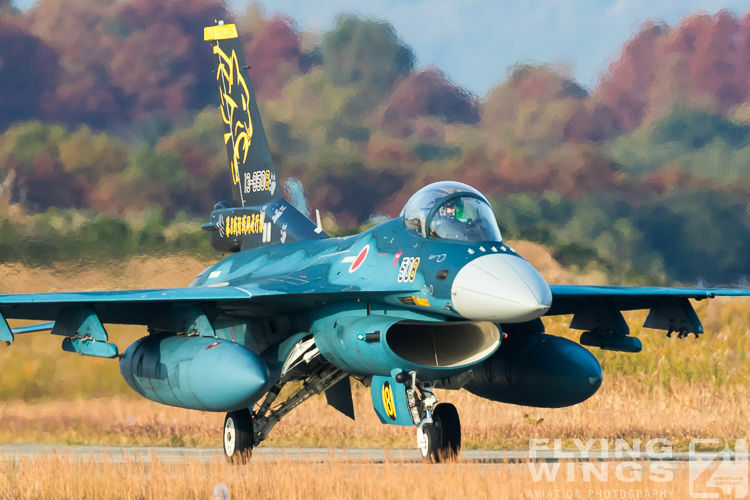 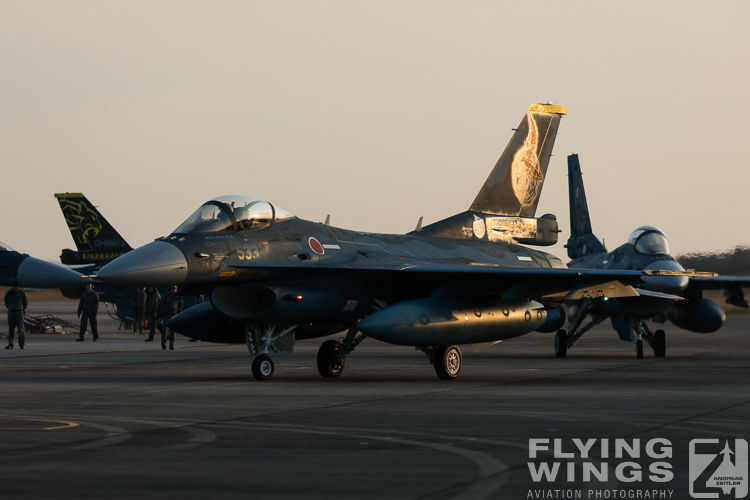 The team used two of the jets from Misawa that wear the famous „WW“ tail code. 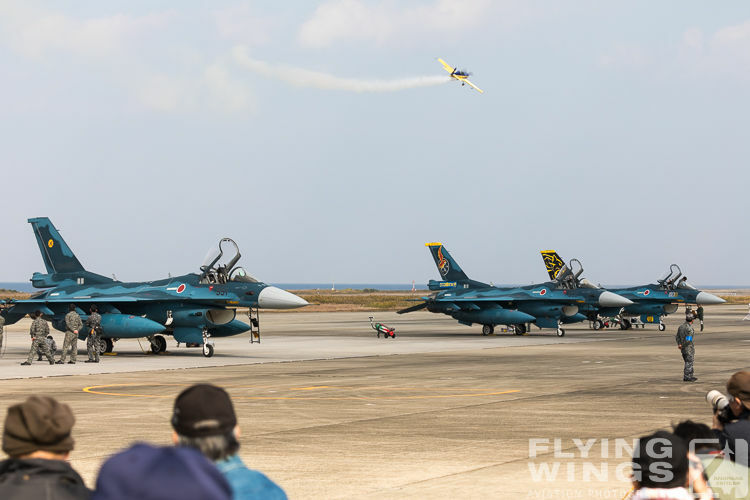 The flying was a pure solo display and no role demonstration. 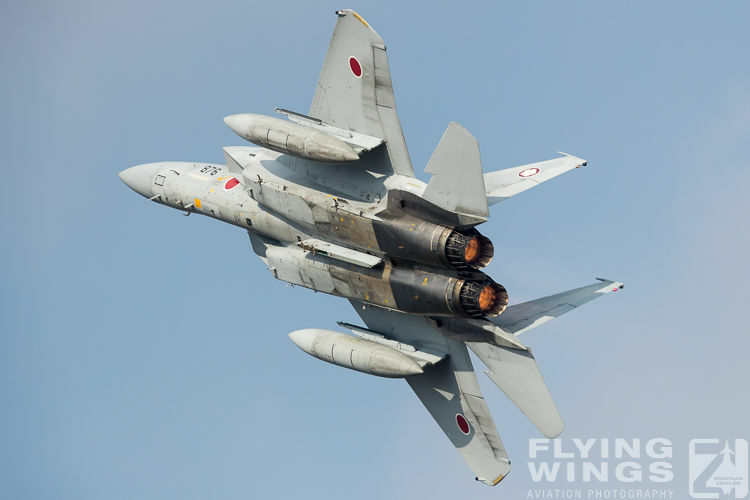 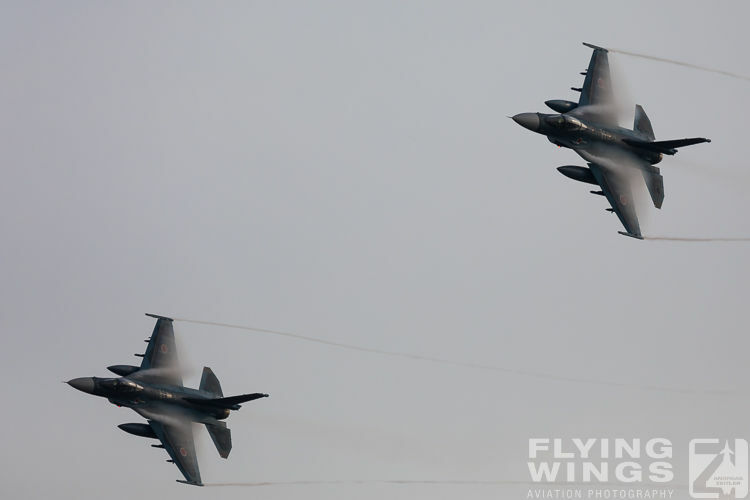 As such it was in strong contrast to the JASDF role demonstrations. 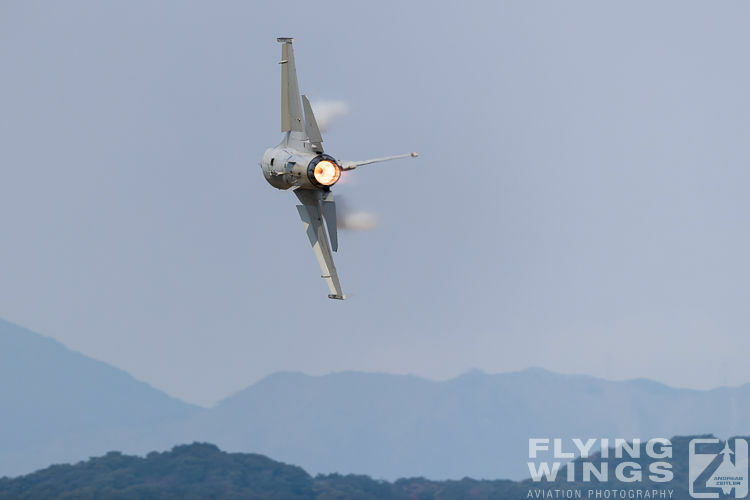 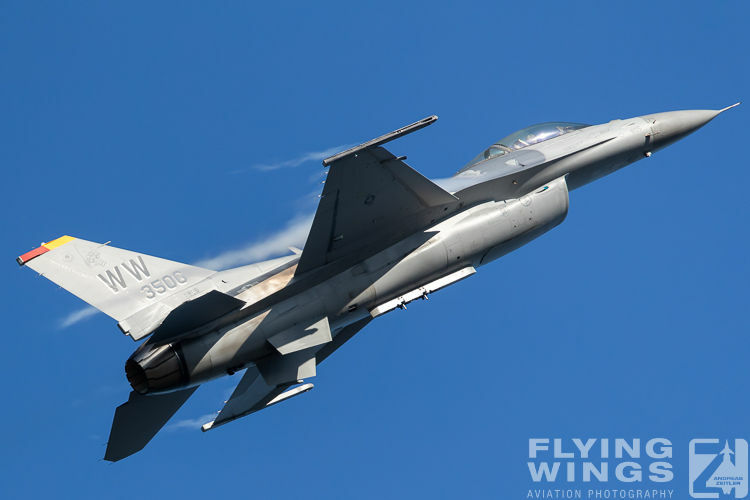 Flying included more vertical maneuvers and the pilot used his afterburner a lot! 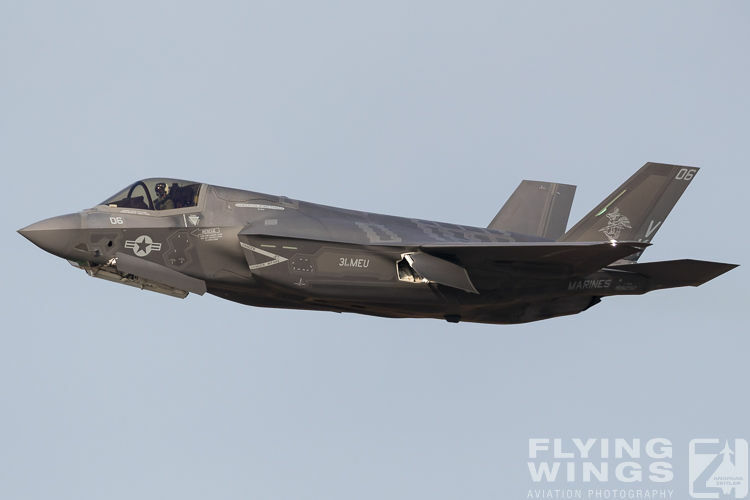 Furthermore I have never seen such a USAF solo jet demo flown so low and so close to the apron. 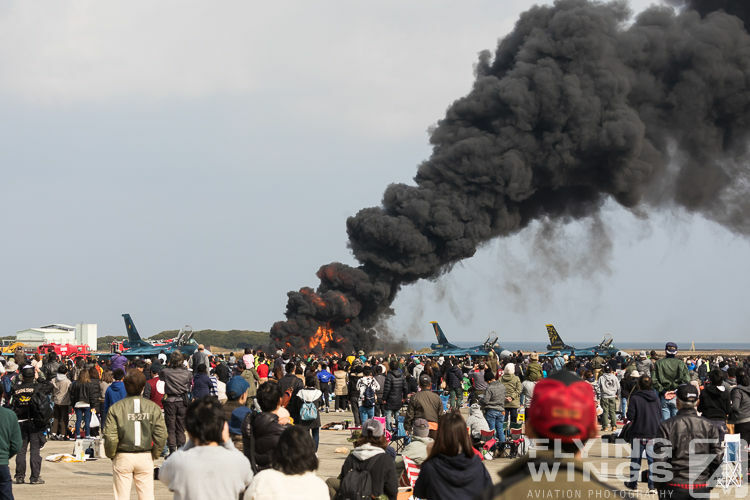 At certain points the passes seemed directly over the first row of the crowdline and it nearly was possible to touch the jet. 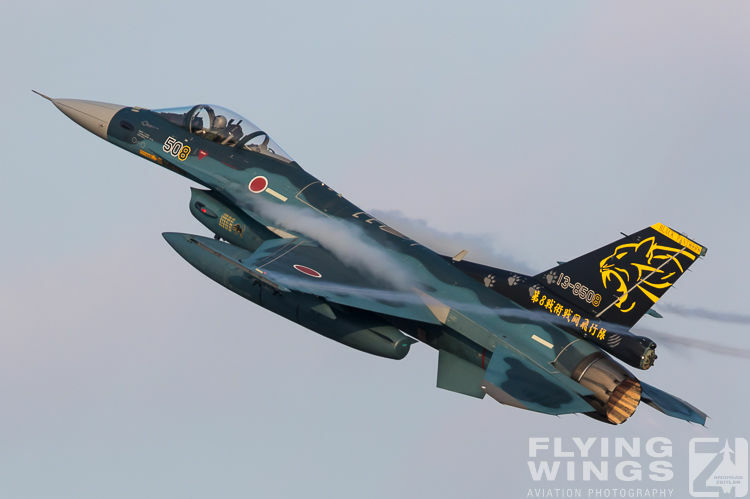 This very special performance earned the pilot a lot of applause as he got out of the cockpit after its display. 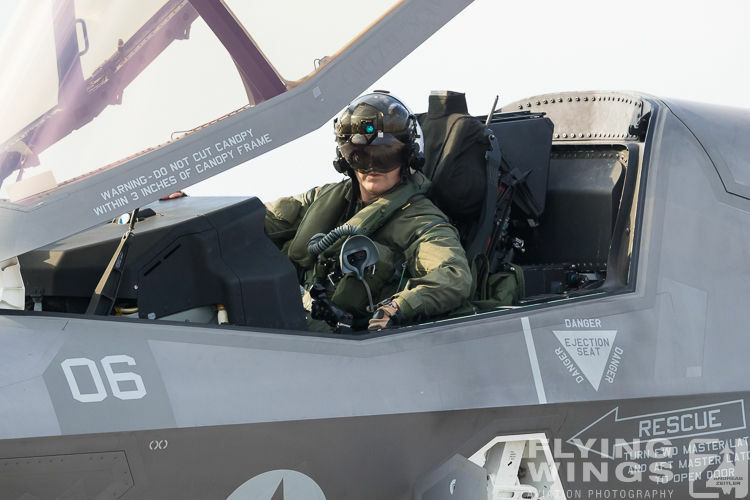 The same public attention as the PACAF F-16 earned the F-35B of the US Marines Corps (USMC). 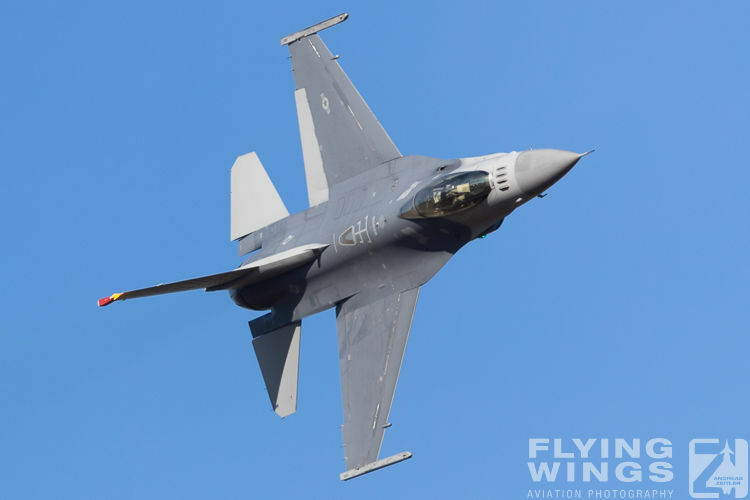 It was only parked for the static display close to the two F-16 jets throughout the day, but arrived early on Sunday morning and left directly after show. 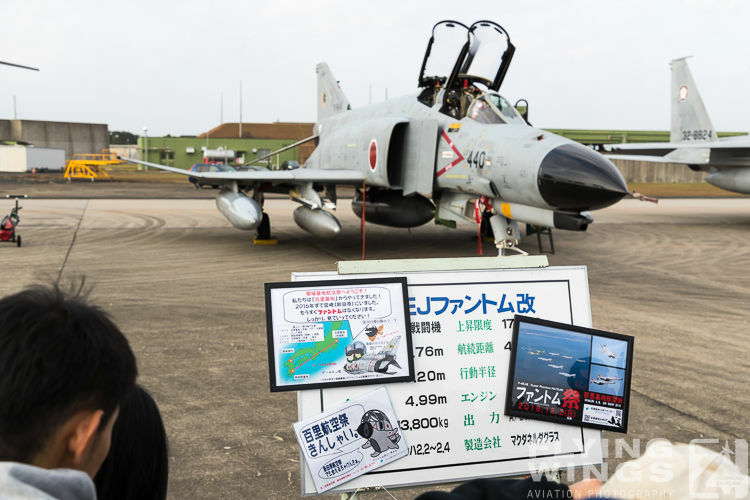 So it was least possible to see the jet in action. 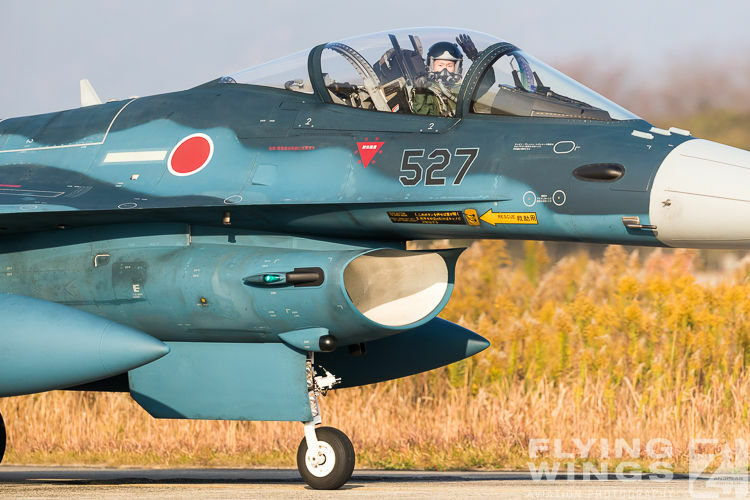 Brining in an F-35B was quite sure in support of Japan‘s acquisition of this new fighter jet and to present this new jet to the public. 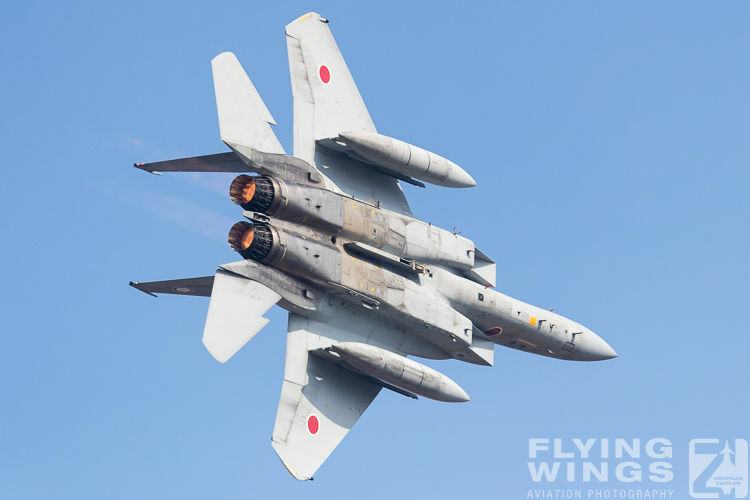 Though the current Japanese jets are regular F-35As, the country is currently also interested in buying the B-Model with the capability of vertical take-off or landing (VTOL) for their aircraft carrier. 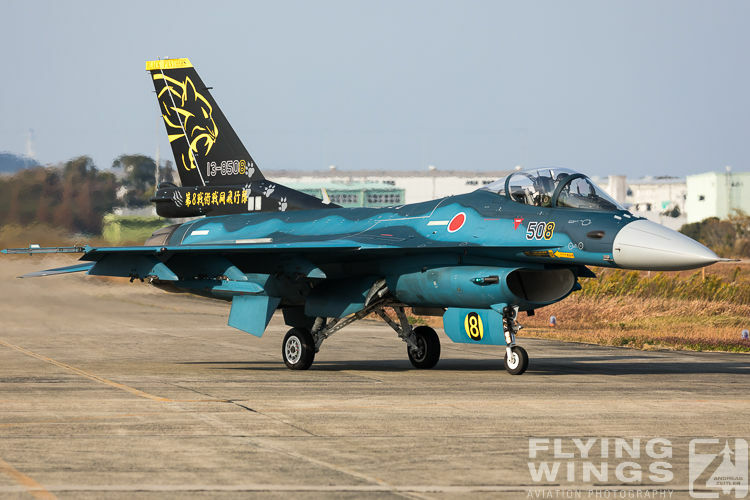 The first squadron of JASDF F-35A is currently set up in Misawa, and as such close to the PACAF F-16s. 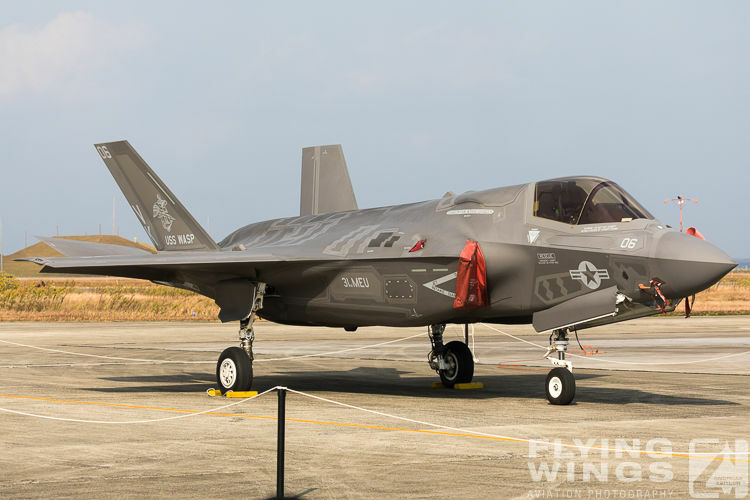 For sure the F-35A will provide more capabilities than the F-2 can, but looking at both jets in the static display it was pretty obvious which one of the two is the nicer looking aircraft. 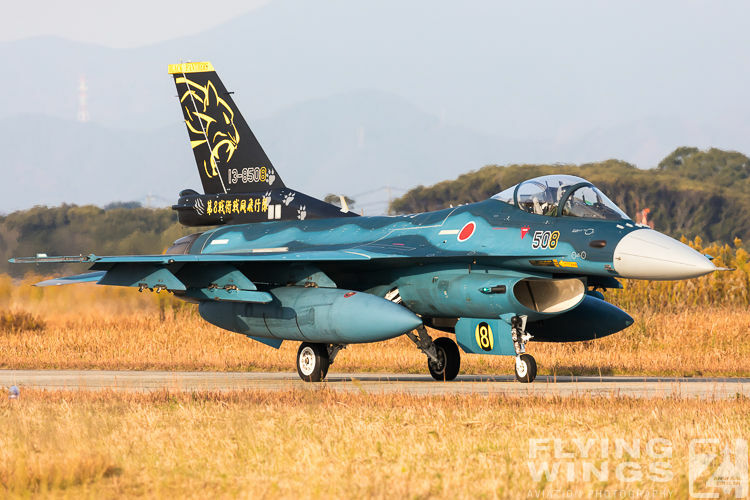 And this was not only for a cool two-blue camouflage compared to an overall dull grey paint scheme. 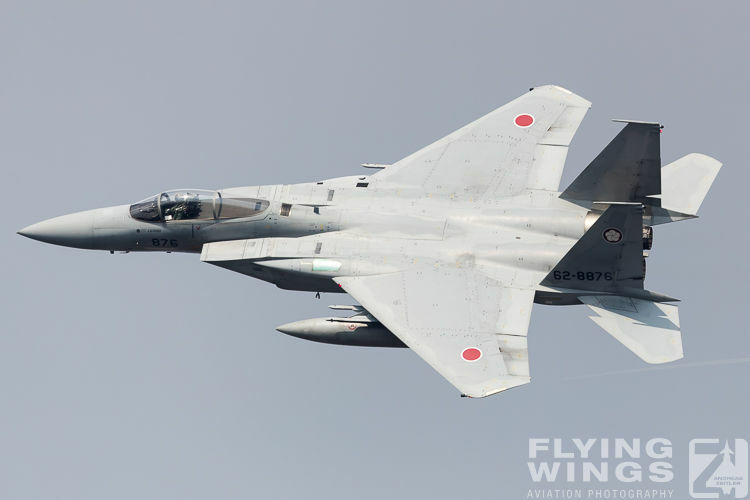 For a change from that many F-2A displays an F-15J from nearby Nyutabaru also arrived for some fly-bys, which were rather high, except for the last one after a ‚missed approach’, which presented a nice photo opportunity. 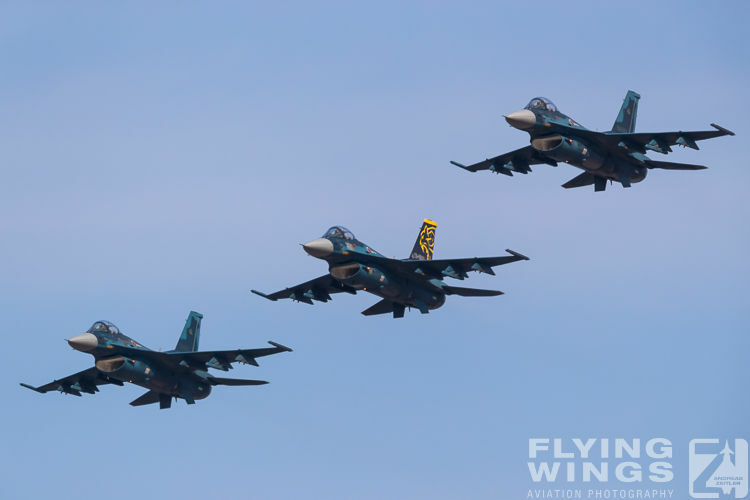 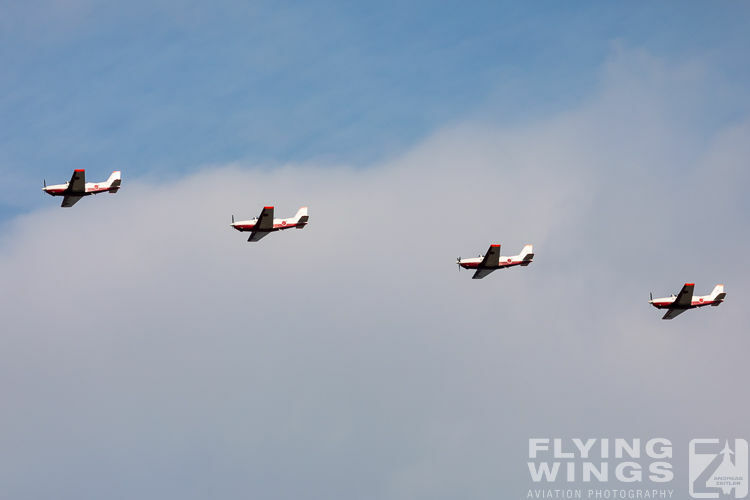 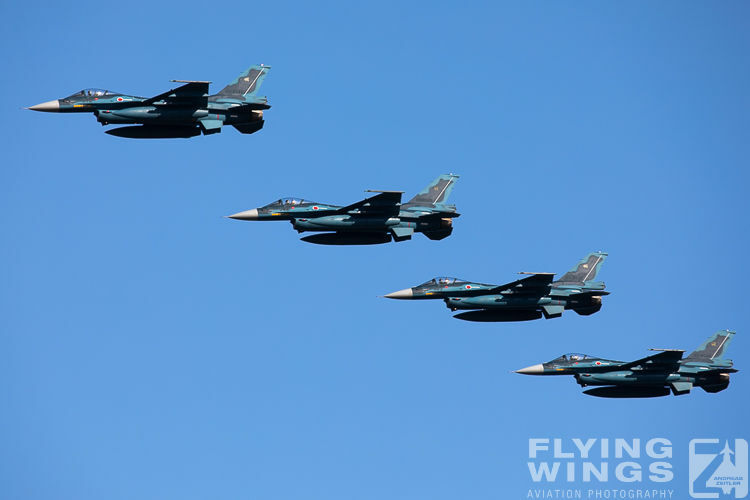 And there were also some formation fly-bys of T-4 and T-7 trainer aircraft from nearby airbases in the morning as well as an aerobatic demo by the "Whisky Papa Competition Aerobatic Team" and its Extra 300. 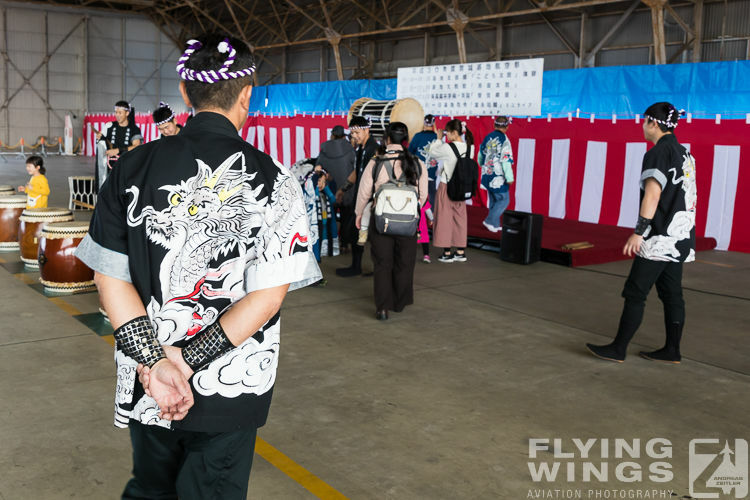 The show on the ground was set up in the same way as in previous years. 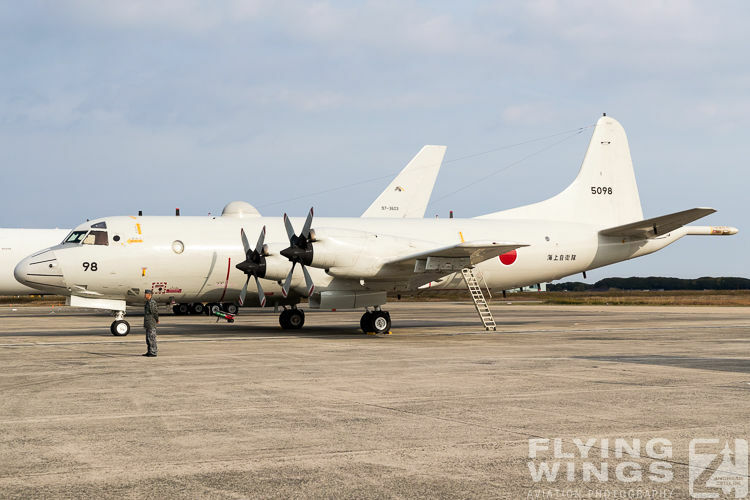 Some bigger aircraft such as a KC-767 air-air refueling tanker or a JMSDF P-3C maritime patrol aircraft were parked on the right side of the apron. 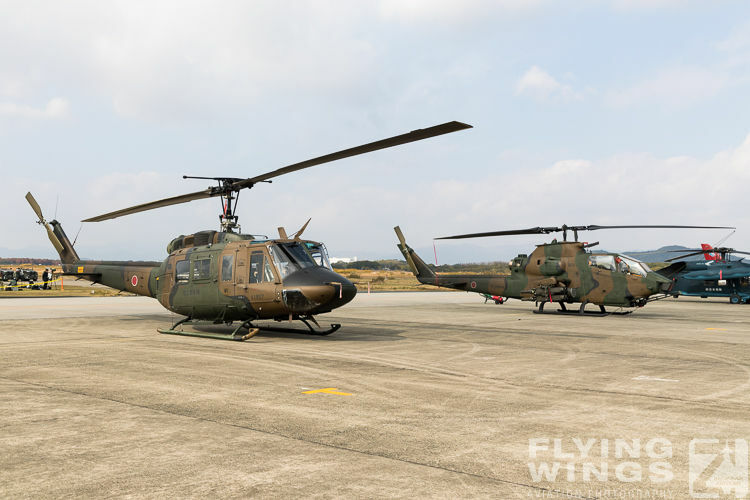 On the left a handful of helicopters, trainers and fighter jets. 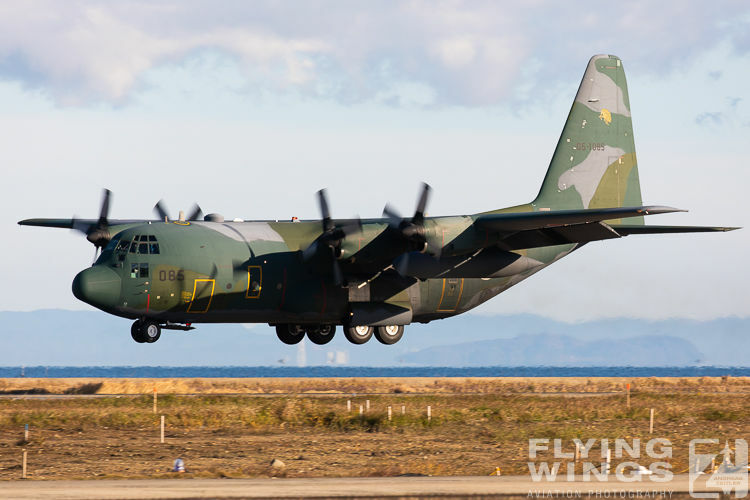 The bigger transport aircraft were parked on the right, leaving all of the front for the local heros. 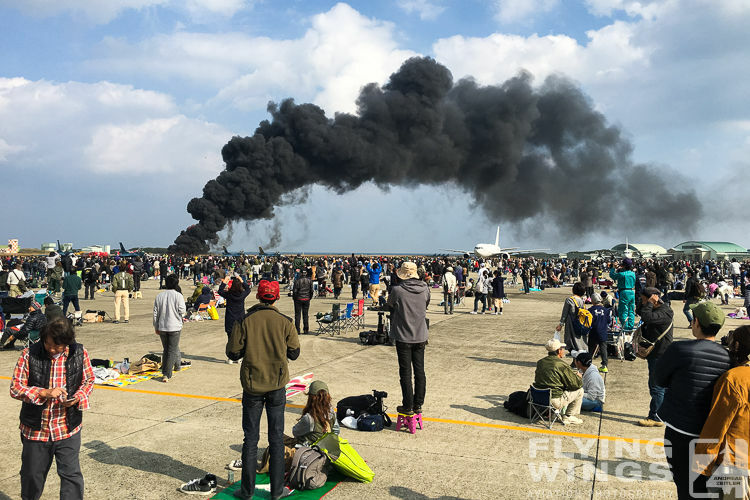 It was well worth attending this 2018 Tsuiki Airshow ,and rarely I have had such nice days. 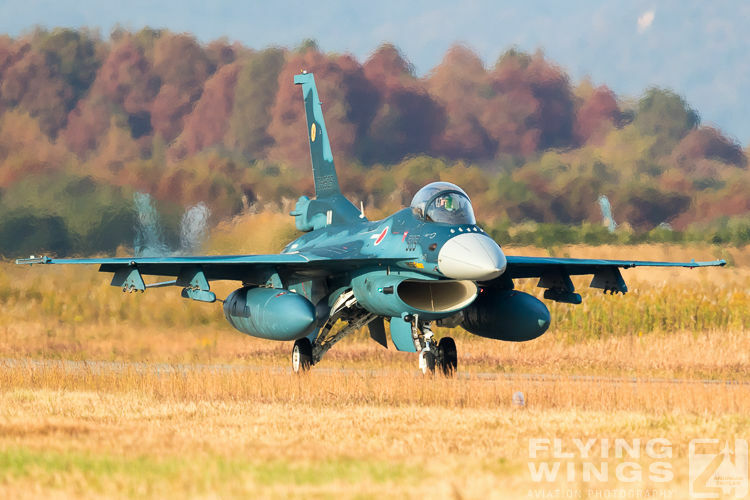 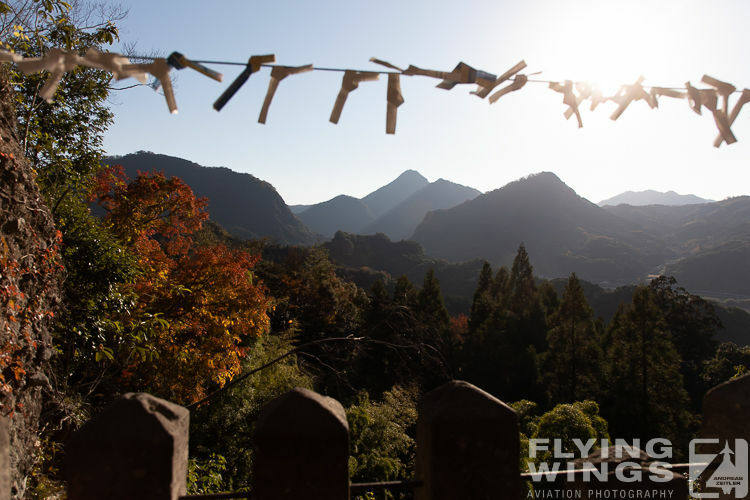 With the families day on Saturday already blessed with gorgeous autumn weather and a deep blue sky, the show at Tsuiki cannot get better than this. 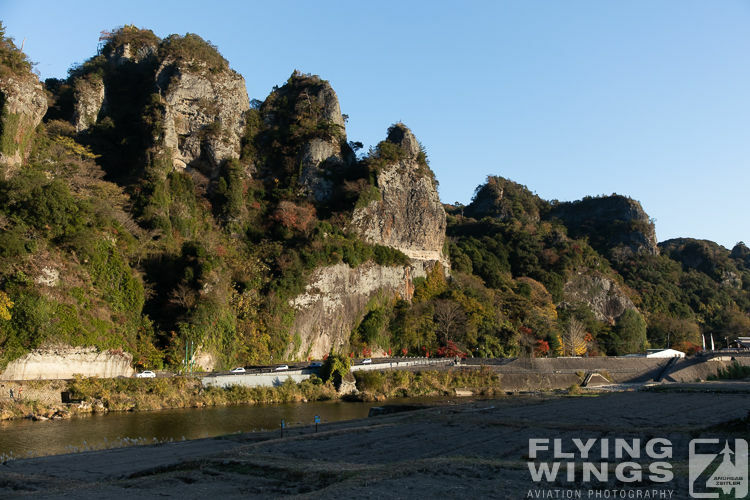 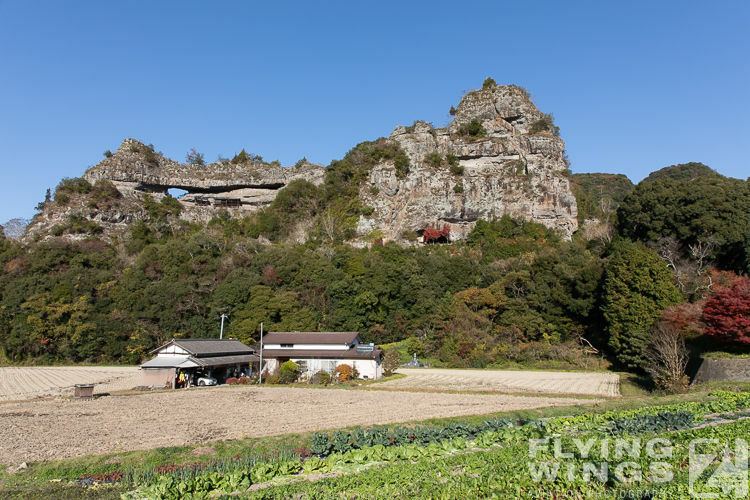 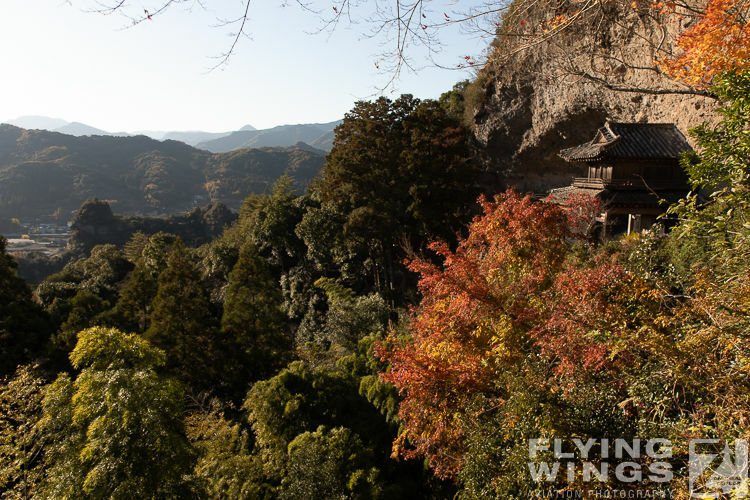 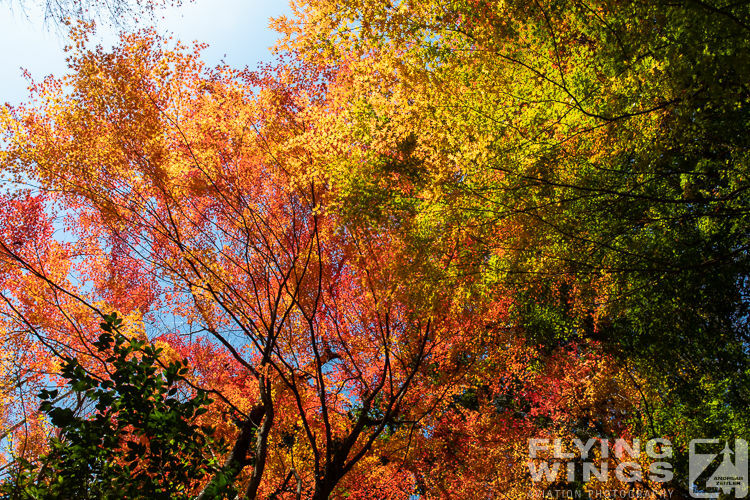 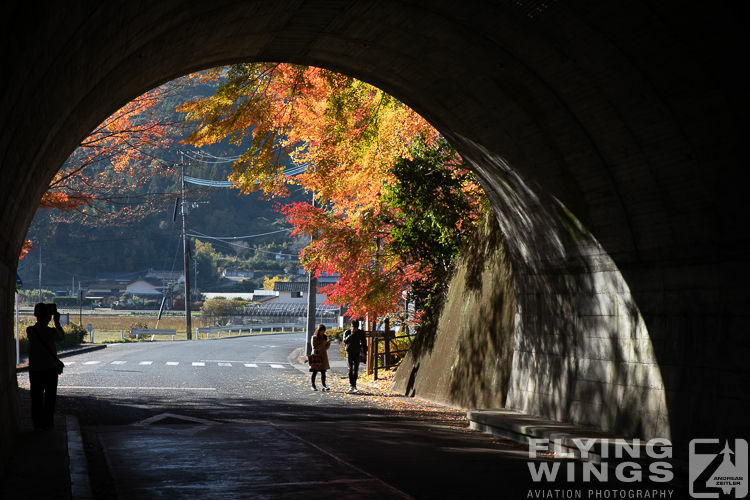 If you are in the area around this time and do not want to see the blue Mitsubishi F-2, but also some splendid red, yellow or orange autumn colors, do not miss the Yabakei „place of scenic beauty“ South of Nakatsu. 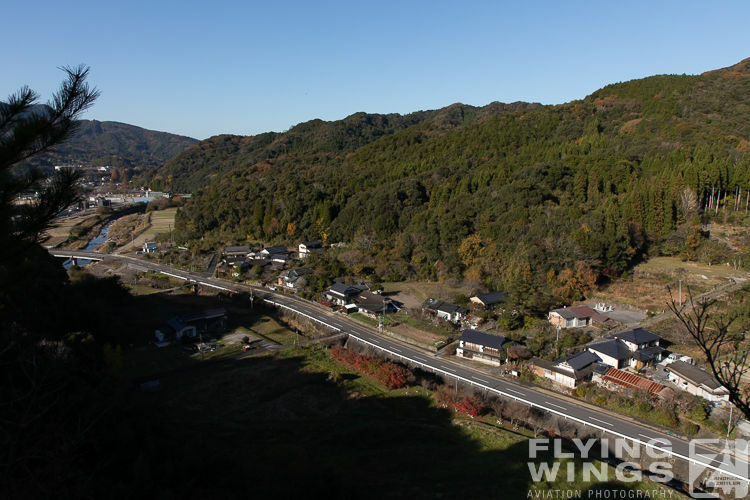 The drive is not far and especially on a nice and sunny you can spend a nice day in the middle of a beautiful Japanese landscape.